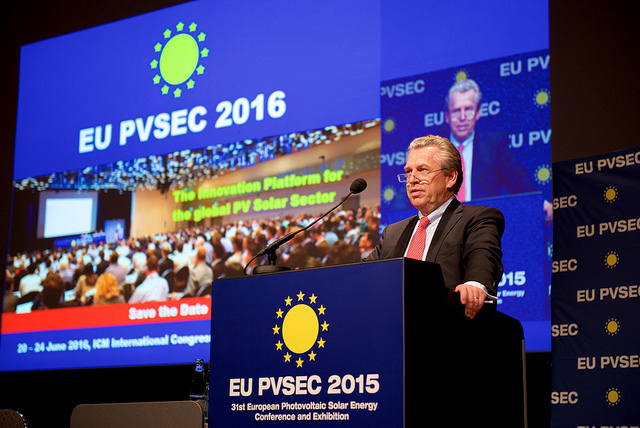 CIGS Thin-Film Photovoltaics – The time to invest is now! The new edition of the CIGS White Paper has been published today. In a joint press release, research institutes ZSW and HZB describe why thin-film PV, in particular CIGS, is a key technology to drive global energy transition. The CIGS White Paper 2019 is available for download. The complete text of the White Paper can also be read online on this website – simply select “Why invest in CIGS thin-film technology?” in the menu. 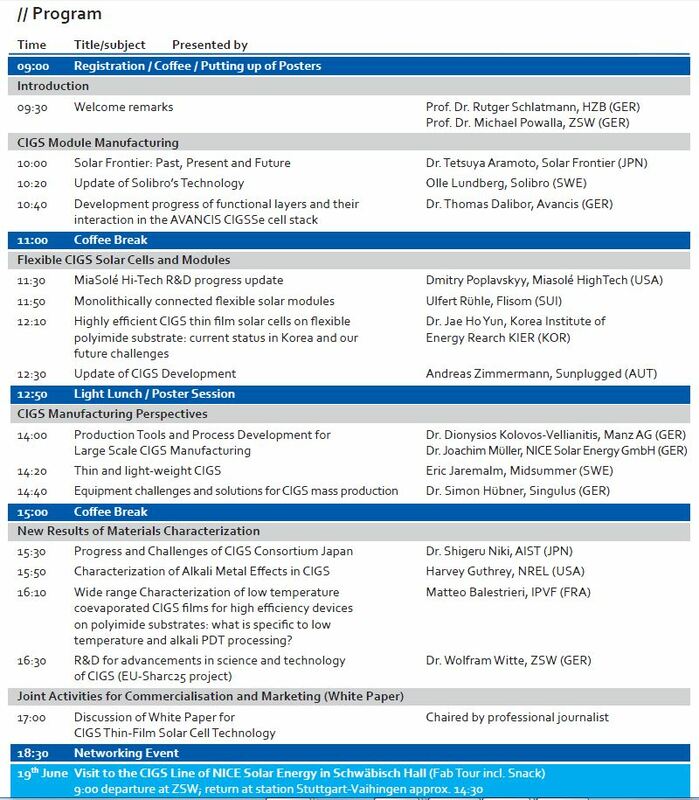 The program of IW-CIGSTech 10, to be held in Paris on 23rd/24th of May 2019, is now available. Check it out on the workshop website! Registration will open soon, so you might as well make your travel arrangements already. The accommodation page will help you with that. All those interested in CIGS thin-film technology will be pleased to know that an updated and improved version of the White Paper is in progress and will be published soon. The members of the CIGS White Paper initiative are working on it! To register directly, please use this registration page. A leaflet with all relevation information can be downloaded as PDF. In 2016, HZB and ZSW will be offering IW-CIGSTech 7 as a parallel event at the 32nd European PV Solar Energy Conference and Exhibition, EU-PVSEC, taking place in Munich, Germany, in June. IW-CIGSTech 7 will take place as a full-day meeting on Thursday, 23rd of June, 2016, including a networking event in downtown Munich in the evening. IW-CIGSTech 7 will be an international workshop focussing on CIGS solar cell technology, combining scientific and technological aspects with their industrial applications. The workshop will consist of invited talks, discussions and poster presentations. Please note that the programme of the workshop will be fully complementary to the main Conference programme topics. The organizers – Rutger Schlatmann (HZB), Michael Powalla (ZSW), and Hans-Werner Schock – would be delighted to welcome you in Munich for a day of lively discussions on CIGS technology topics. Further details are available on the workshop website. If you would like to be put on the workshop mailing list, please contact the organizers at info [at] iw-cigstech [dot] org. 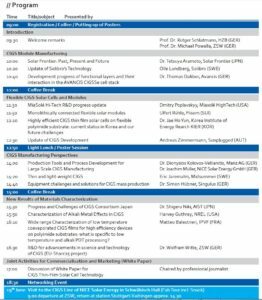 Many CIGS experts are aware of the tradition of the International Workshop on CIGS Solar Cell Technology (IW-CIGSTech) usually being held at Helmholtz Zentrum Berlin (HZB). For the scope of last year’s event, see the IW-CIGSTech 6 website. In 2016, HZB and ZSW will be joining forces to offer IW-CIGSTech 7 as a parallel event at the 32nd European PV Solar Energy Conference and Exhibition, EU-PVSEC, taking place in Munich, Germany, in June. IW-CIGSTech 7 will take place as a full-day meeting on Thursday, 23rd of June, 2016, including an evening event in downtown Munich. The organizers – Rutger Schlatmann (HZB), Michael Powalla (ZSW), and Hans-Werner Schock – would be delighted to welcome you in Munich for a day of lively discussions on CIGS technology topics. Further details will be published soon. If you would like to be put on the workshop mailing list, please contact Claudia Brusdeylins.